This Superfood Salad Makes For A Perfect Spring Lunch! We all want to eat well, but sometimes the options that are available seem less than appealing. Yet with its delicate blend of herbs and legumes, this quinoa chickpea veggie salad makes for both a delicious and nutritious choice. The protein-filled chickpeas and the fiber-rich quinoa fill us up while being friendly to our waistlines, and we love how fresh and flavorful the herbs make it. Even better, this grain salad takes only moments to throw together, so we often prepare ours in advance and take it on the go for a healthy lunch, or for a light summer dinner! 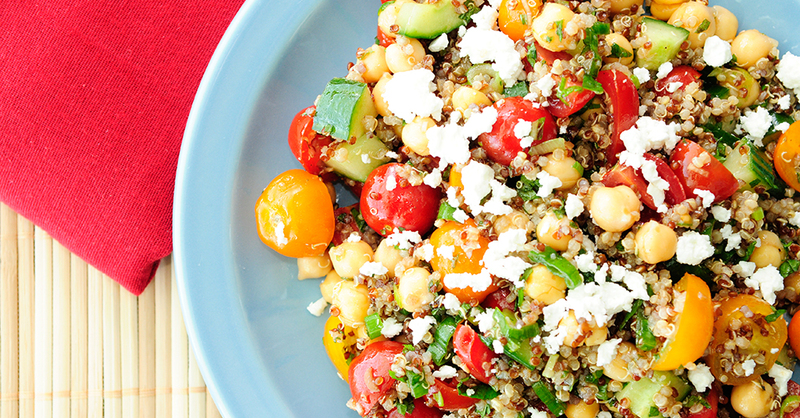 In a large bowl, add quinoa, chickpeas, cucumber, cherry tomatoes, green onions, and cilantro, and toss to combine. In a small bowl, whisk together the olive oil, vinegar, lime juice, salt, pepper, and Dijon mustard. Pour dressing into the quinoa mixture and toss to combine. Top with feta, serve, and enjoy!